The New Mexico State Aggies (1-10) host the Idaho Vandals (1-10) at 1:30 p.m., in Aggie Memorial Stadium, in the season finale for both teams, Nov. 30. This will be the 20th meeting between the two schools and the 11th game played in Las Cruces. NM State and Idaho played independent schedules in 2013, as both teams will join the Sun Belt Conference in football only beginning in 2014. The first meeting between the Aggies and Vandals came back in 1971 as Idaho pulled out a slim 19-14 win in Las Cruces. 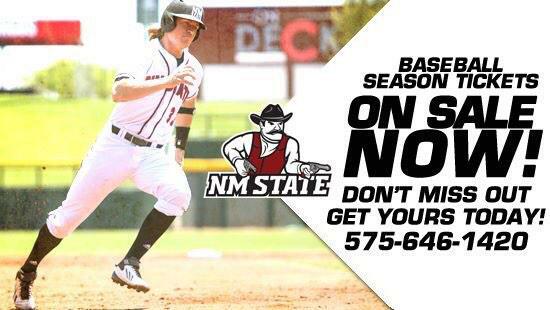 The Vandals hold a 14-5 series lead over NM State, as the Aggies have won four of their five wins in Las Cruces. The Aggies last win in the series came in 2011 as they defeated Idaho 31-24. You can listen to all the action with the ‘Voice of the Aggies’ Jack Nixon and color analyst Preston Williams beginning at 2:00 p.m. on KRGT 104 FM. Also catch the action in Spanish with Bob Sherman and Sal Betancourt on Vista 98.7 FM. The Aggie volleyball team heads to the Western Athletic Conference volleyball tournament, which runs Nov. 25-27. NM State is the No. 1 seed and will await the winner of match two between No. 4 seed Idaho and No. 5 seed Kansas City. The Aggies play in match four on Tuesday, Nov. 26 at 7:30 p.m. (MT) in Grand Canyon Arena located in Phoenix, Ariz. KSNM AM 570 will produce all postseason matches the Aggies play in starting with the match on Tuesday. The 5-1 Aggies play three games three games in six days with two of those games at home. NM State opens the week with a home game against Bethune-Cookman, Monday, Nov. 25 at 7 p.m. (MT) in the Pan American Center. The Aggies then host Prairie View A&M Wednesday, Nov. 27 at 7 p.m. before hitting the road to play Colorado State in Fort Collins, Colo. with first tip set for 4 p.m., Saturday, Nov. 30. All three games are scheduled to air over the radio waves on KGRT 103.9 FM. The game on Monday will be produced for TV with AggieVision providing the coverage. The game against the Rams on Saturday will air on TV and be produced by ROOT Sports. Please check with your local cable/satellite provider to airtimes. The women’s basketball team will host the Hotel Encanto Thanksgiving Classic Nov. 29-30. The Aggies tip-off the classic against Northern Illinois at 11 a.m. on Friday, Nov. 29 in the Pan American Center. NM State will then wrap up the tournament with a game on Nov. 30 at 1 p.m. against Milwaukee.